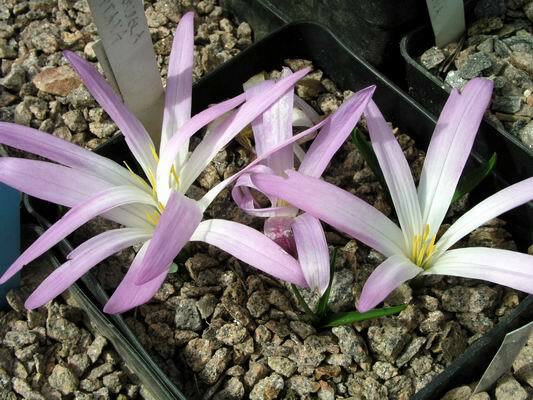 Here is another picture of Colchicum montanum, I showed it just emerging in log 33, now it is in full flower, showing off its narrow petaled flowers to their best. 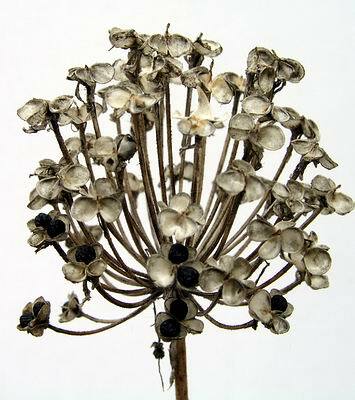 It is not just the flowers of bulbs that are decorative; the seed heads are more often than not, also attractive. The fruits, in the case of many of the arums, provide a striking feature in the autumn garden; I especially like them at the stage when there are both red and green berries together. 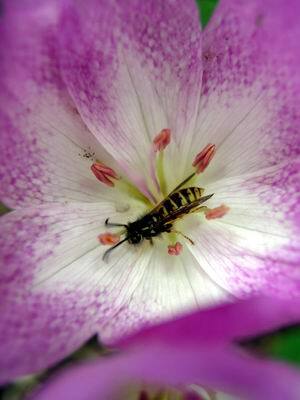 The camera is a great tool and can be used to isolate an interesting seed head from the background of the garden. It is then that we can study and appreciate the beauty of the form; a few black seeds have yet to be dispersed from this Allium pratti seed head. 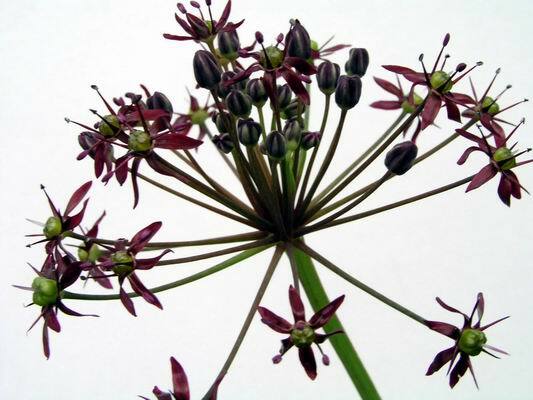 The same technique used here to show a flower head of Allium wallichii, a late flowering Himalayan species with triangular-sectioned stems and a head of small dark purple flowers. The flower is like one of those fireworks that burst into a star with each leg then bursting into a host of secondary stars. 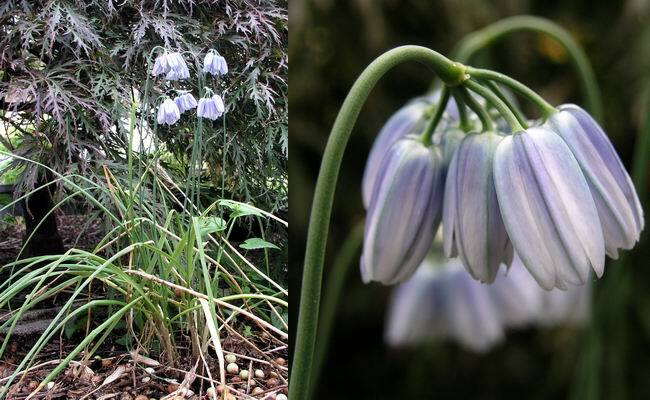 Another, and one of my favourite onions, is the late pale blue flowered Allium beesianum, another Himalayan species named after the famous seedsman 'Bees'. 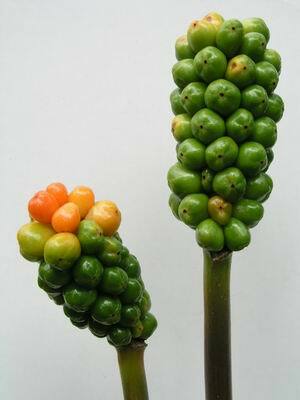 This plant likes the cool moist growing conditions found in our humus-rich beds. We are just finishing re-potting the last few frits before they get the first 'storm' (a thorough soaking) on the first of September. Fritillaria pluriflora has a similar bulb to that of F. lilaceae with a number of loosely attached scales. 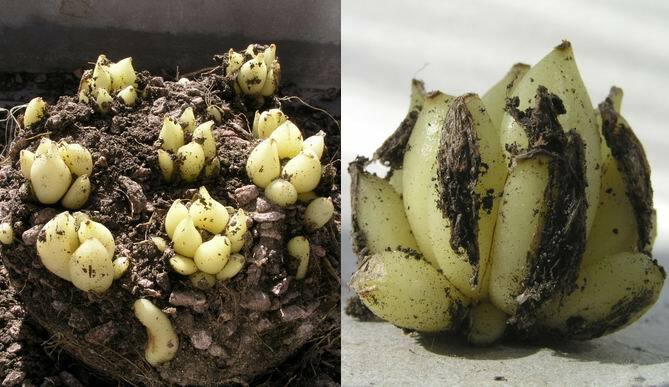 Care needs to be taken not to break them all apart as this would affect the bulb's ability to flower in the spring. It is inevitable that a few small scales will become detached as you handle them but that will not stop the larger bulbs from flowering, and, the detached scales will grow on to increase your stock. You can clearly see the dry remains of last year's scales still attached as all the scales are replaced annually. 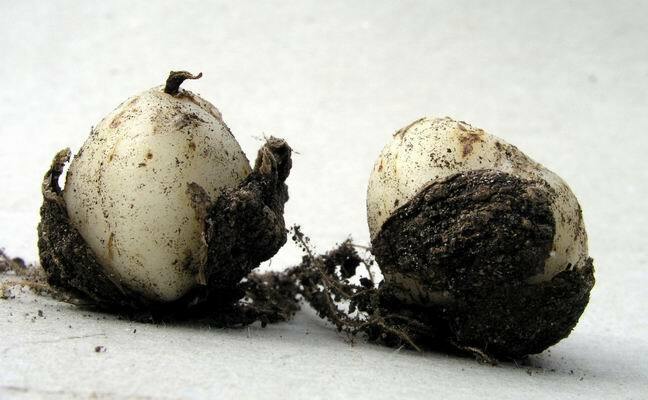 The Eurasian type frit bulbs are also replaced annually and you can see the remains of the old scales attached to the base of these new bulbs above. 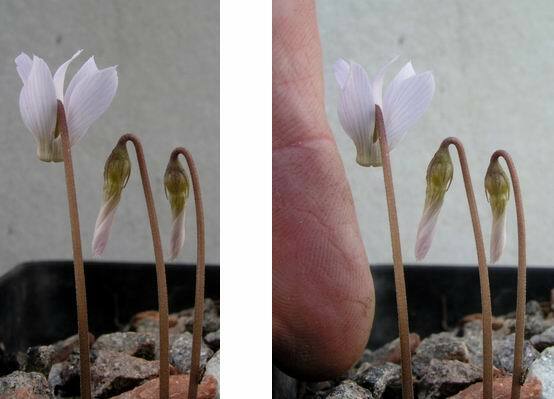 The smallest cyclamen that we grow has to be Cyclamen intaminatum, it is only when I put my finger beside it, in the right hand picture, that the true scale is revealed. Despite its tiny stature it is one of the hardiest of cyclamen and we grow it in several troughs and raised beds where we can fully appreciate this bijou. I grew this crocus from seed collected in Turkey as C. vallicola; it produced a single flower last year but I only paid it a passing glance. This year there are four flowers and as I was looking at the frame, where all our pots of C. vallicola are flowering, I decided it looked that wee bit different. It was only on a closer examination that I discovered that while it is superficially very like C. vallicola, it is in fact the closely related species Crocus kotschyanus ssp. suworowianus. This just proves how important it is to verify the names applied to your seed raised plants as much as you can. We have Crocus nudiflorus appearing everwhere just now, it spreads by stolons and seeds it self around, a very acceptable situation to be in. One of my least-liked angles for taking a picture is looking straight down on a plant, like above, I never think it tells us much and rarely shows the plant at its best. 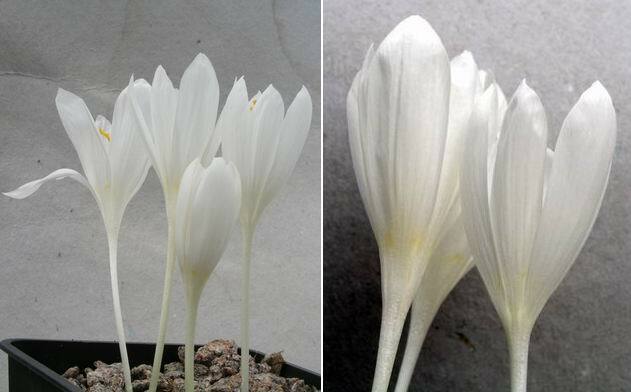 However I wanted to illustrate the 'flying bugs' eye view of these colchicums - they are like a beacon shining out of the darkness, saying "here I am". 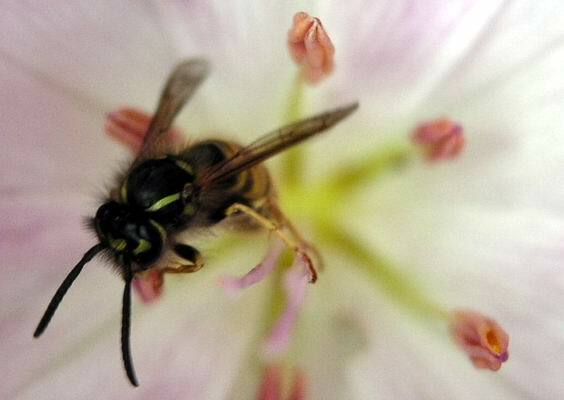 The white centre and funnel shape of the flower are luring this wasp straight to the centre of business, the pollinating department. Everything about this flower is just like the runway lights at an airport, guiding this flyer to a safe landing to do the pollinating. Which he does so obligingly. 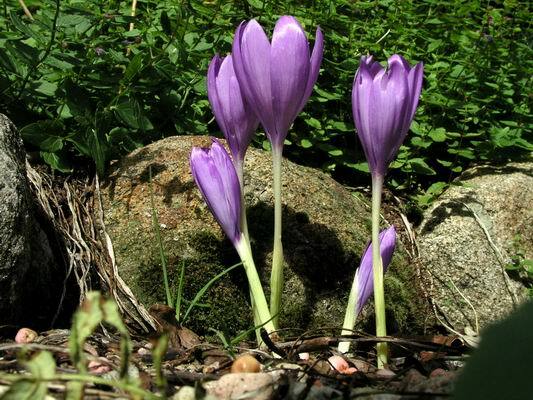 I just wish I could find out the secret of getting a good germination, or should I say any germination of Colchicum seeds. 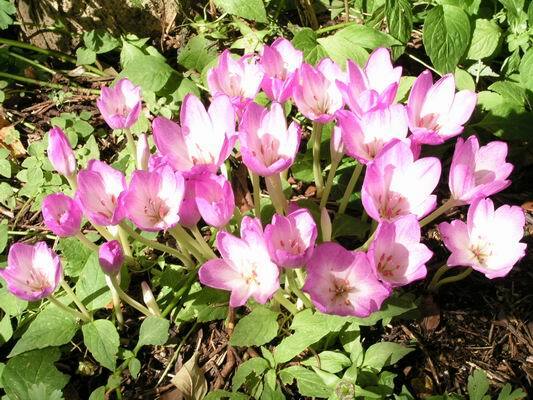 I can count on my fingers the number of pots of Colchicum I have germinated over the years.